Tanah Lot Temple Bali is located just off the coast, perched on solid rock, and overlooking the Indian Ocean. The sunset on the horizon is the most expected by visitors. Dedicated as a place of worship to the god of the sea God Varuna for the blessing of safety and happiness. A harmonious blend of beautiful sunsets, offshore tranquility, ancient shades, and spiritual vibe. This holy temple is situated at Beraben Village, the District of Kediri, Tabanan Regency, Bali. Visitor can access this place directly from Ngurah Rai International Airport, for about 26 Kilometers (less than two hours). Let's take a closer look to the amazing of the Tanah Lot Temple! Pura Tanah Lot is dedicated as a place of worship to the god of the sea (God Varuna) as ruler of the sea as well as for safety. The Temple is one of the important temple in Bali perched on a solid rock just off the coast. This temple a beautiful panorama overlooking the Indian Ocean. 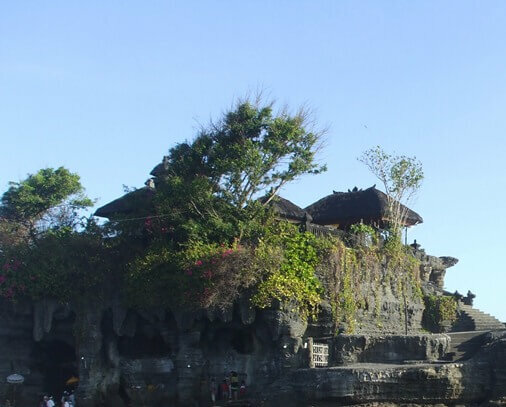 There are also several temple around Pura Tanah Lot with its own fuction and purpose such as Penataran Temple, Penyawangan Temple, Jero Kandang Temple, Galuh Enjung Temple, Batu Bolong Temple, Batu Mejan Temple, Tri Antaka Monument, and Pekedungan Temple. Penataran Temple has a function to worship for safety and happiness. Jero Kandang Temple serves as a place to worship for the safety of animals and plants. Galuh Enjung Temple serves as a place of worship to the goddess Dewi Sri for land fertility. Batu Mejan Temple or Beji Temple serves as a place of worship to invoke the holy water. 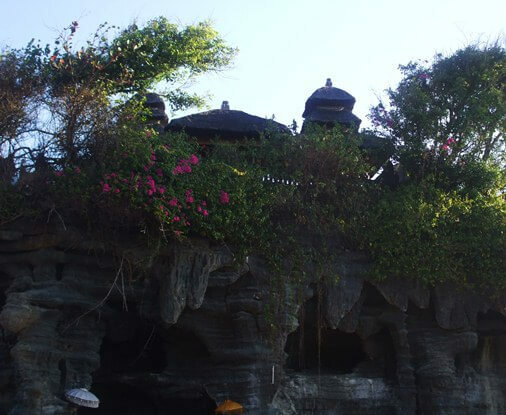 Pura Batu Bolong is located on the beach of Segara Batubolong in Canggu Village. 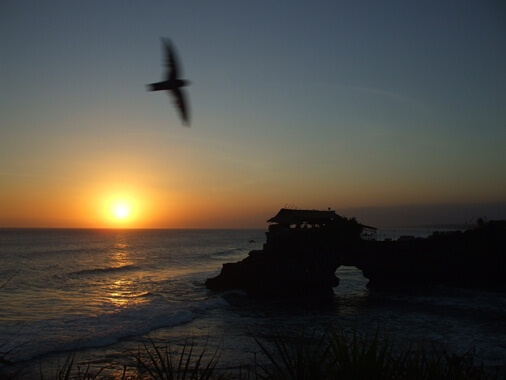 The temple can be seen from Tanah Lot area while enjoying the beautiful sunset. 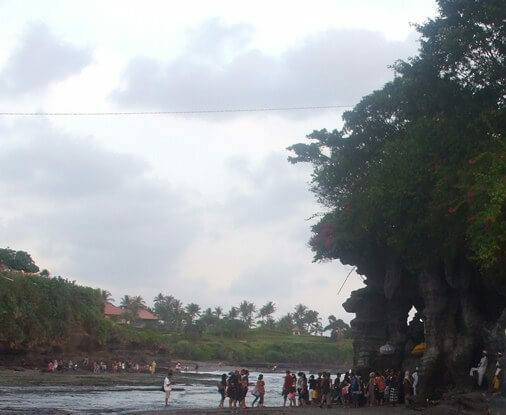 The existence of Batu Bolong Temple is closely linked with the journey of MPU Kuturan (at the XI century) and Dang Hyang Nirartha (at the XV century). Batu Bolong Temple serves as a place to held Melasti ceremony to several temples such as Pura Luhur Natar Sari Apuan, Pura Batur, Pura Puncak Padangdawa Tabanan, and other temple. The beach here is surrounded by solid rock cliffs with beautiful cave formations. Occasional waves hit the rocks, creating huge water splash. During afternoon at the horizon (starting at around 4.30 p.m. until 6.30 p.m.), the sun began to fade and changes its color into red orange. 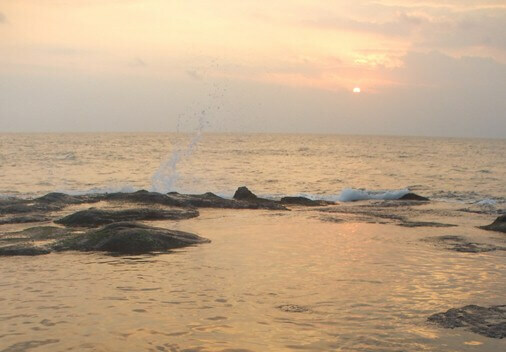 The sun entered a phase of sunset with the romantic shade of the sea water, clouds and the sky. Beautiful colors with the huge splash created by the waves that hit the rock formations. A beautiful sunset in the tranquil moment off the coast and covered by the shades of spiritual. 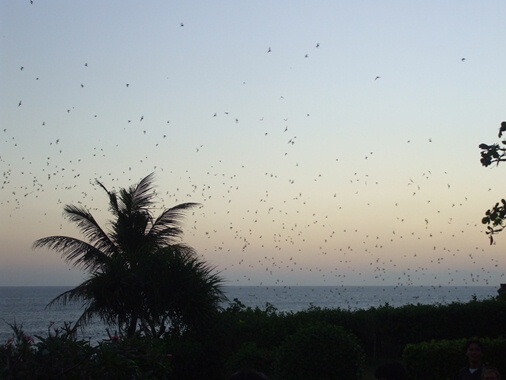 Shortly after sunset on the horizon and the the day turned into evening, visitors can see the unique attractions of thousands of bats. Tanah Lot Bats fly out of the cave that located around the eastern cliff of Enjung Galuh. These bats sleep during the day and started out at the night, search for food with the help of ultrasonic sound. These bats will come back again into the cave after full of supply at midnight. In the beach cave there are highly poisonous sea snakes and become a guard of the temple. The existence of the Tanah Lot holy snake is believed to be the shawl of Dang Hyang Nirartha to protect himself from the bad things done by Bendesa Beraban. These sea snakes have black and silver strips. It’s nesting inside the caves near the beach at the base of the rock cliffs. Tanah Lot holy snake can only be found around the temple area. Visitors can ask the temple guard to show the location of the holy snake. The temple history is strongly associated with the journey of a Hindu priest from East Java namely Dang Hyang Nirarta. Told in ancient manuscripts "Dwijendra Tatwa" the holy priest come from Blambangan, East Java to the Gelgel Kingdom, Bali. Bali Island at that time is under the reign of King Dalem Waturenggong. After settling for some time in Gelgel Kingdom, the holy priest requested permission to the king to take a journey or Tirta Yatra. The journey has an intent to take a closer look to the society. After receiving the permission, he departed for the west and arrived at Pura Rambut Siwi. After settling for some time and interact with the local people, he continued the journey eastward, passing through residential areas and interact with the community. He always pay attention to the natural beauty of its path during the trip as a manifestation of the greatness of the creator. Soothing beauty and full of happiness. Until one day the holy priest arrived in the Beraben Village and see the beauty of a small island just off the coast that has a sacred atmosphere. He decided to stop a while and rest on the island. It is known by fishermans and together they went to him. At the evening, before take a rest he taught religious guidance, moral virtues and teachings to the people who come there. It is known by Bandesa Beraben (village chief of Beraben). Initially Bendesa Beraben is not like the things done by Dang Hyang Nirarta because many of his followers moved and follow the teachings from the sacred priest. Bendesa Beraben requested him to leave Beraben Village. But nature willed otherwise and Bendesa Beraben finally gave up and followed the teachings of Dang Hyang Nirarta. Thanks to his services, Bendesa Beraben given a "Keris" by Dang Hyang Nirarta. The keris is called Ki Gajah Baru, highly respected and stored in Puri Kediri. The priest advise to build a shrine in that place because it feels so pure, has a high spiritual vibe and good as a place to worship the God Varuna, for safety and prosperity of the world. People who receive his guidance follow the advice and set up the shrine. Further more the shrine to be known as the Pura Tanah Lot. Amazing temple, worth a visit and truly soothing! Take your time to travel to Tanah Lot Bali. Hopefully helpful and thank you! 4. Pura Ulun Danu Bratan.